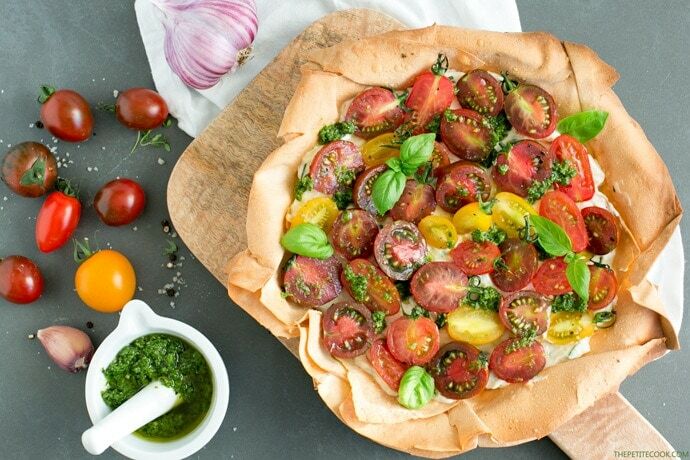 A light and colorful Heritage Tomato Phyllo Tart packed with vibrant summer flavors – Ready in just 20 min, it makes a showstopping vegetarian starter or main to share at outdoor events. I’m absolutely in love with savory tarts. They’re one of my favorite food to make when feeding a large crowd. A large tasty tart is easy to put together in minutes and can feed up to 10 people, making it perfect to share at all those summer parties. 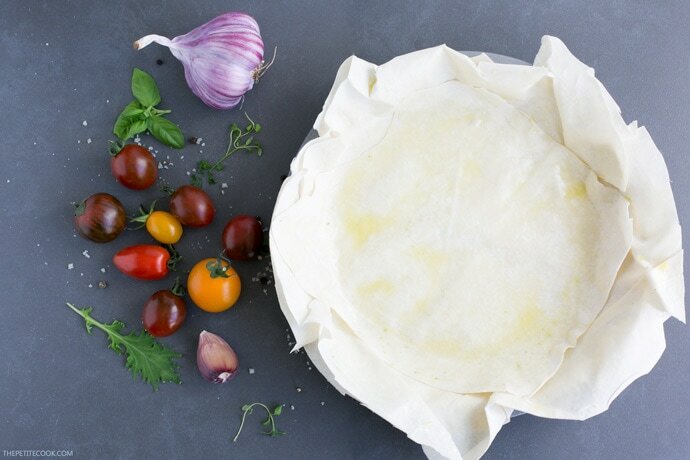 Putting together this Heritage Tomato Phyllo Tart couldn’t be easier and takes just 20 min start to finish. 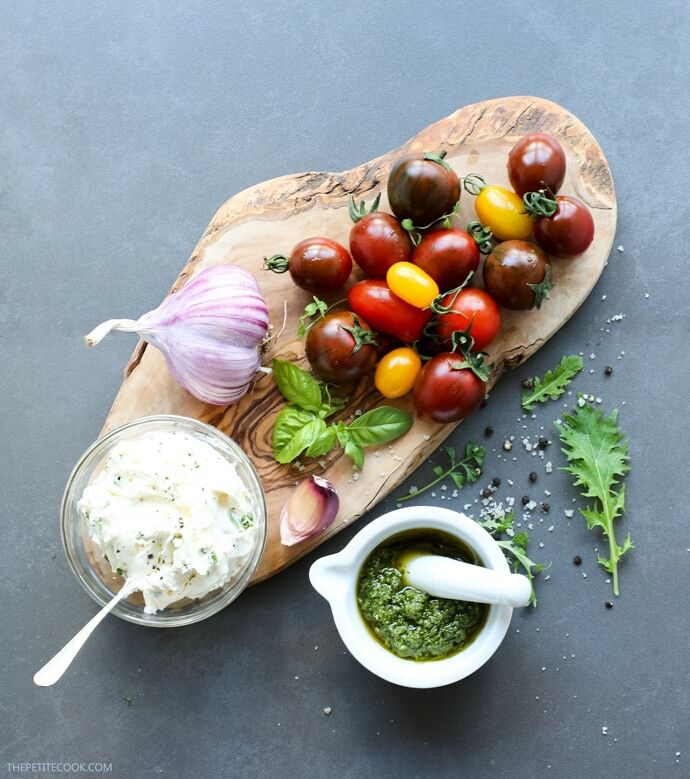 Even better, you only need 4 easy-to-find simple ingredients including: phyllo pastry sheets, fresh ricotta cheese, homemade pesto, rainbow heritage tomatoes (or regular cherry tomatoes). While shopping at the farmers’ market during the weekend, I got the chance to put my hands on these beautiful heritage tomatoes. Look at them! So colorful, sweet and delicious, I just had to take them home with me. I’m not a big fan of raw tomatoes, but these were so sweet I kept snacking on them on my way home. 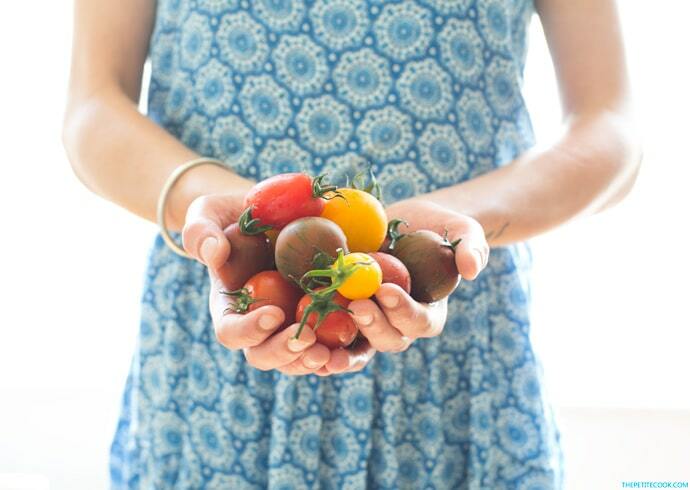 If you can’t find them at your local market, just opt for regular cherry tomatoes. Because how sweet this variety is, I prefer to put them raw and just bake the tart a further 5 min. But if you use cherry or mini plum tomatoes, they tend to be a little bit bitter (especially the non-organic option), so before arranging them on top of the tart, sweat them lightly on a pan with some olive oil and a pinch of cane sugar and salt & pepper. This Heritage Tomato Phyllo Tart is super versatile and easy to customize with your favorite ingredients. 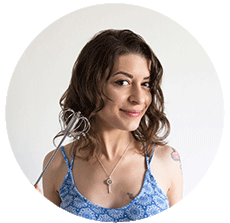 Got puff pastry instead of phyllo? Go for it. Don’t like basil pesto? Try rocket pesto or roasted red pepper pesto. Fancy another cheese? 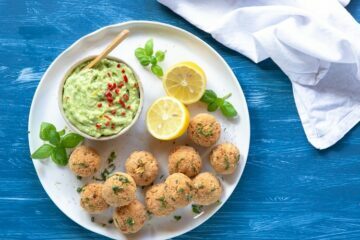 Substitute ricotta with quark or goat cheese. Play with whatever ingredients you have at hand to make a new version of this tart every single time. I love using phyllo pastry to make savory tarts. It has a nice and crunchy texture, whilst being very light and airy. Plus, it bakes so much faster than traditional shortcrust or puff pastry. To make this tart I use 3 phyllo sheets, but you can add another layer or two if you like. Lightly brush each sheet with a little extra virgin olive oil, then line your tart tin, gently overlapping the sheets. Spread the ricotta over the base, then top with the halved tomatoes. Bake for about 15 mins, until crispy and golden brown, then allow to slightly cool before serving. Sprinkle with pesto all over and top with fresh basil leaves before serving. I like to make the tart ahead of time and serve at room temperature, but even warm is super tasty. 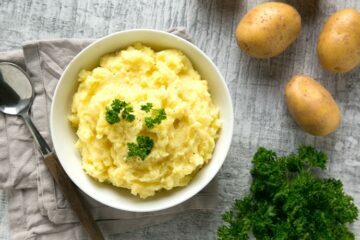 This is a brilliant recipe, which once you’ve made, I guarantee you will go on making again and again. It’s literally the easiest and most sublime tomato recipe I know. Serve it at barbecues or any outdoor eating event, it’s both great as a starter or as a main course with a salad. 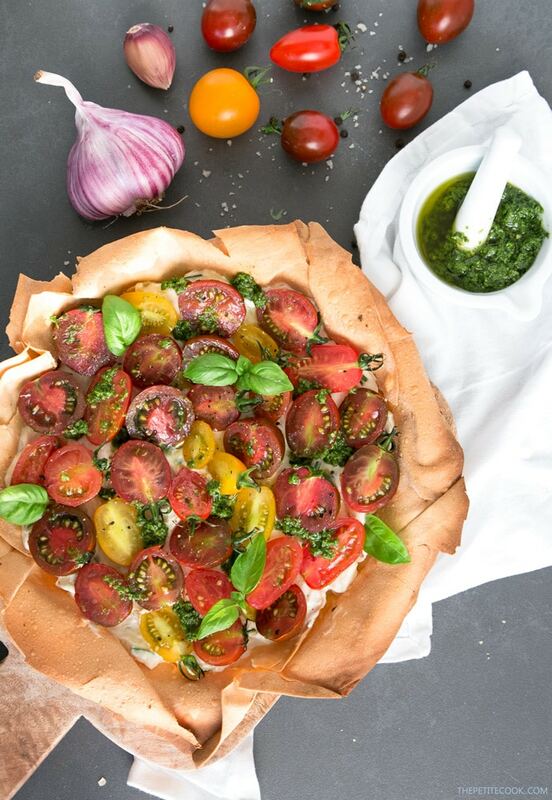 Plus this Heritage Tomato Phyllo Tart is conveniently vegetarian, making a fantastic idea for meatless Monday. 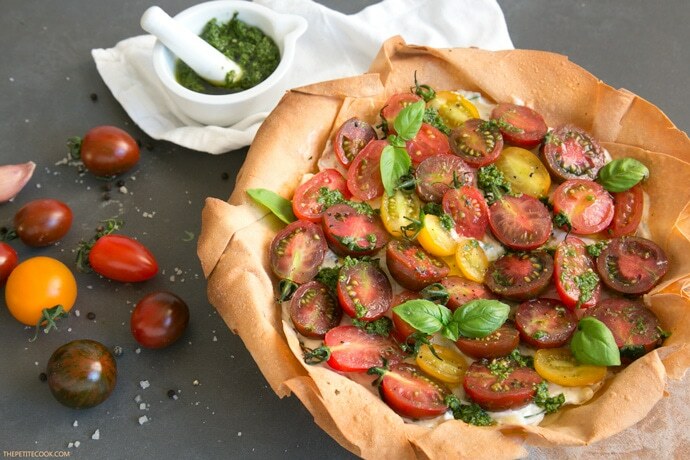 I hope you friends will give this colourful tomato tart a try. If you do, please leave a comment below and let me know how you liked it! Even better, snap a picture, tag it #thepetitecook and share it on Instagram! I can’t wait to see all your summer creations :). Heat oven to 180C/ 360F. Lightly grease with olive oil an 8 inch tart pan. Prepare the ricotta filling by mixing all ingredients together in a small bowl. Season with salt and pink pepper and refrigerate until ready to use. Lightly brush each phyllo pastry sheet with a little extra virgin olive oil, then line your tart tin, overlapping the sheets. Spread the ricotta over the base, and scrunch the pastry edges together to create a nice border. 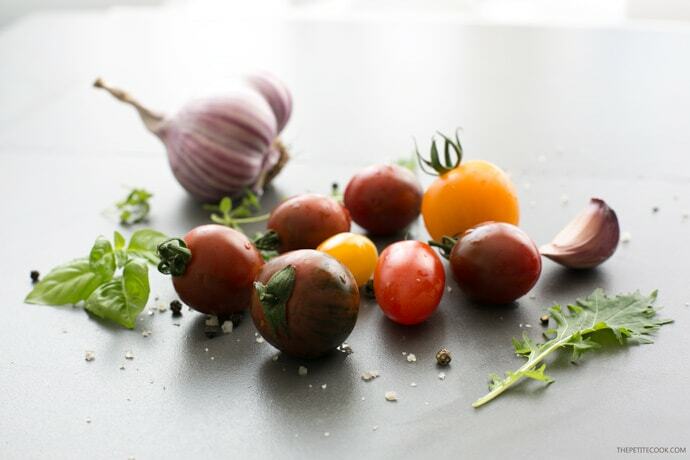 In a large bowl mix together halved tomatoes with a glug of extravirgin olive oil and season to taste. Bake in the oven for 15 mins, or until golden and crisp. Remove from the oven and allow to cool a little. Sprinkle with fresh basil pesto and top with extra basil leaves before serving. Serve warm or at room temperature, and store in an airtight container in the fridge for up to 2 days. Heritage tomatoes are my favorite. They are healthy and delicious. Thank you for sharing another way to enjoy tomatoes. What a beautiful colourful dish! Any time I am at a farmers market, I stock up on a selection of tomatoes to make something like this. Me too, I love them so much! Love heritage tomatoes! Looks so good! They’re so incredibly sweet, I can’t have enough! 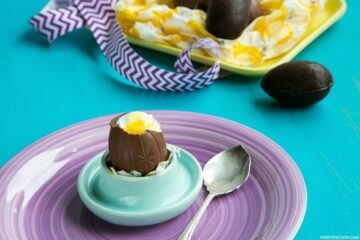 It does look quick and easy to make. I will be trying my hands on this recipe. It s really easy to make I promise! Thank you:) hope you give it a try! Colorful heritage tomatoes are one of my favorite things in the whole big world. Your use of them in this rustic tart is visually stunning. Nicely done. This looks so great! I’ve wanted to experiment more with savory tarts like this. Thanks for the inspo!